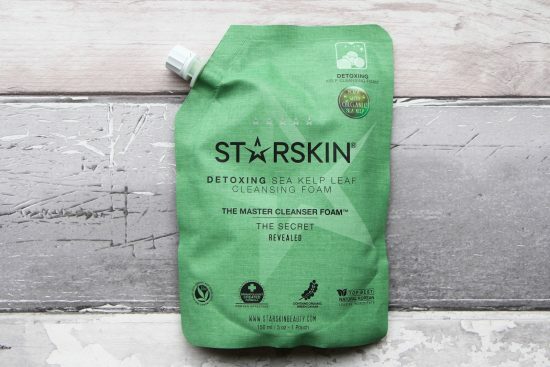 Starskin, The Master Cleanser, Detox Sea Kelp Leaf Cleansing Foam. Woo! That’s a product name and a half, isn’t it? I had to add some commas in just to break things up a bit, otherwise I could imagine people expiring from lack of oxygen before they reached the end of the sentence. This little cleanser almost passed me by completely because it had slipped to the very side of my inbox and had jammed itself between a load of folded press releases. As you can hopefully see from my skilled photography (!) the packaging is rather different to anything else you might have come across, cleanser-wise. The Master Cleanser isn’t housed in a pot or a tube, a pump-action bottle or a screw-top jar; this is packaging at its most minimalist and frugal. A simple squeezy pouch with plastic nozzle – no fuss, little waste and easy to get every single last drop of cleanser from the inside. Why don’t all cleansers arrive like this? I’ll tell you why not: they don’t bloody well stand upright! Which is fine if you have a load of bottles next to the bath to prop it up in, or a wire hanging thing in your shower where you can shove it alongside the flannels and razors and whatnot, but if you don’t have a handy place to stow it, its like trying to grapple with a miniature drunk who just wants to lie down. Good for travelling though, I’d imagine. Nice and light and squashy. And you get used to the whole “lying it flat” thing, so long as you don’t mind slipping on it every time you step into the shower tray. …but you can’t use it on your eyes. It does say something to this effect; okay their words are exactly to this effect – avoid the immediate eye area – but, as always with my cleanser testing, I couldn’t resist taking one for the team and so I applied it directly to my eye area. Not even tentatively. Straight over the lashes in the hope of removing my mascara (it didn’t) and onto the lids to work away at my eyeshadow (did a grand job there). It stung like an absolute b*stard, I won’t lie. Which is annoying, because I was hoping that their warning would just be a “playing things safe’ sort of warning. If I’m using a cleanser, I like to be able to use it all over my face, including my eyes. It’s just the way I am. Unless, of course, it’s one of those half-cleanser half-treatment sort of deals, like those exfoliating cleansing powders or in-shower quick-fire face masks. Those I can forgive, because I usually use them in the morning and I don’t need to remove any eye makeup and, quite often, I use them after my cleanser and not instead of. I suppose I could use the Master Cleanser only in the morning, but still. With its luxurious texture, it would be such a bonus if it could be used over the eye area too. So, top marks for packaging innovation, even if the blasted thing does flip-flop about all over the place, and in terms of cleansing, good marks for a formula that seems to deep-clean without drying. Minus points for the eye situation. On that note, if you have oily skin and are looking for a very quick, instant deep-clean and polish that you most definitely SHOULD NOT get in your eyes, then I’ve recently rediscovered Vichy’s Normaderm Cleanser + Scrub + Mask. I don’t use the scrub step because scrubs often make me a bit ruddy, but you can give it a quick whizz about if you fancy, otherwise leave it on for a few minutes as a mask and then rinse. Instant brightness. The Master Cleanser from Starskin is £17.56 here, Normaderm 3-in-1 Cleanser + Scrub + Mask is £8.25 here.